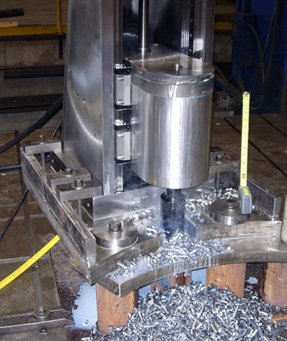 Based on a prospective need, Laron was asked to develop a means to efficiently and accurately remove seized studs from Reactor Coolant Pump Housings installed in the Reactor Coolant System inside the Reactor Containment Building. Laron engineered, built and tested a field machine tool capable of drilling a 7” hole with no pilot hole and which could maintain true perpendicular/circularity within .003” at a drill depth of 16”. 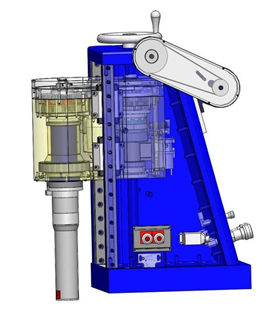 The tool was also designed to be capable of “single point machining” threads in situations where significant galling or thread damage had occurred. The tool was mounted on a fixture which allowed a rapid transition and set up from one stud location to another and could be operated from a remote location thereby assisting the plant in the achievement of their ALARA standards. The tool and crew were on site for the period of the Reactor Coolant Pump disassembly. Although the tool was not ultimately required, mock-up operational tests of the machine demonstrated that the machine could drill a Reactor Coolant Pump stud in less than 17 minutes of drill operating time leaving an easily removable “slinky” in the housing threads with no damage to the Reactor Coolant Pump Housing or housing threads.